And a relative of the crow. In the forests about Oporto. With the gold fillings of dead men’s teeth. And whose feet come out round either eye. 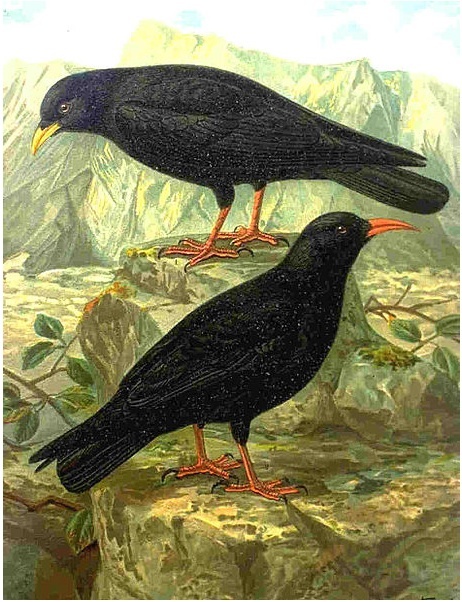 The Yellow-billed or Alpine Chough and the Red-billed Chough of the Corvidae family. Illustration by Johann Friedrich Naumann (1780–1857) courtesy Wikipedia. “The Chough” is from James Reaney’s first book of poems The Red Heart (1949), and it also appears in The Essential James Reaney (2009), available from The Porcupine’s Quill.